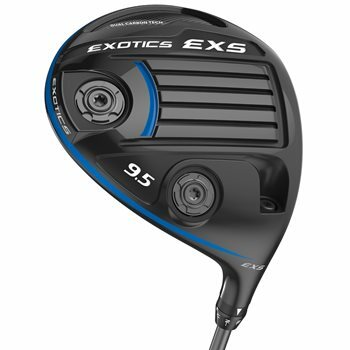 The Exotic EXS Driver features a Flight Tuning System (FTS) that includes an adjustable hosel that allows for plus two or minus two degrees in loft, RollFace Technology for an expanded sweet spot, and Dual Carbon Fiber placement that is ideal for weight distribution. Also includes a SlipStream Sole with wider speed channels that create an even faster clubhead speed by minimizing turf interaction. Dual Carbon Fiber Crown and Toe creates extreme weight savings re-distributed to optimized positions creating an extremely high MOI, as well as improved acoustics. RollFace Technology incorporates modified bulge and roll on the toe to create straighter shots. Variable Face Thickness delivers maximum CT off more parts of the face.